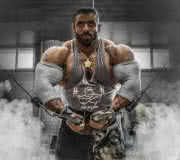 Primarily known as the Persian Wolf, Hadi is one of the most incredible bodybuilders to come in to the IFBB Pro ranks. He's made an incredible impact in the 212 class in 2017. Watch out for Hadi! Diet is the most important part of any training or bodybuilding program.. because you need to feed and recovery and grow the muscles. It's key to always get the right nutrition and Hadi knows this! The Persian Wolf is by far the best Iranian bodybuilder past and present, a true inspiration not just for his local fans of Iran, but throughout the entire world. His conditioning and overall balance are supreme! While only a pro since 2016 and coming up as runner up to Roelly, he set his value quite high. He's now moved to the 212 class and is the top contender to win the championships from the legendary Flex Lewis! Tip 5 - Always go in to the gym with a game plan.. get the work done!